Do you want to make an impression with your next event? Are you tired of the monotony of an annual event were everything is predictible? If your answer is yes then you have come to the right place. 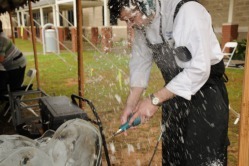 Frostbite Ice Sculptures will be happy to create fantastic ice sculptures at your event site. For more information and pricing please contact us.